The Puntacana-Information-Guide.com official Gran Ventana Beach Resort Review will be up shortly, but here is a description of the amenities at this resort. If you have any further questions about the resort, feel free to contact us at any time. This wonderful Beach Resort offers a distinctive blend of sophisticated design with the charm and hospitality of the Dominican Republic. The resort's lobby extends with beamed ceilings and a view of the ocean as its centerpiece. Exceptional service and a sense of relaxation greet singles, couples and families from the moment of arrival. Developed by the Central Bank of the Dominican Republic in conjunction with the World Bank and the Inter-american Bank of Development in 1976, Playa Dorada Complex is based in Field and Club of Golf, public Club of Beach, sidewalks and avenues and other public services. 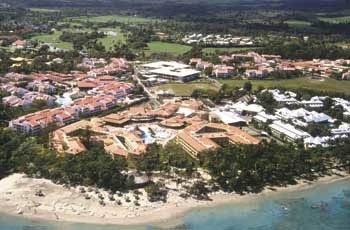 The first hotel in playa dorada was inaugurated in 1981, developed thanks to the help of the Central Bank of Dominican Republic. It was later sold to a North American company which delivers it to the Operator Jack Tar International. 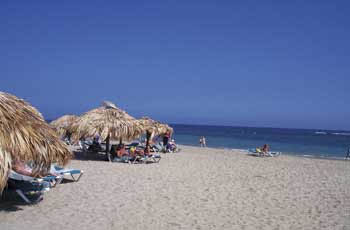 Gran Ventana Beach Resort Review of Restaurants and Bars:Gran Ventana Beach Resort offers a variety of dining options. With three a la carte, all-inclusive restaurants featuring authentic Caribbean cuisine, fine Italian dishes and fresh seafood, there is something to satisfy every craving. For a refreshing cocktail or savory snack, guests may choose from seven bars located throughout the resort including a beach club snack bar, lobby bar, swim-up bar, pool-terrace bar, coco bar, tiki bar and late night snack bar. 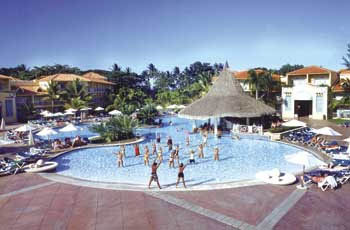 Guests may also sample the weekly cocktail during the poolside Manager's Cocktail Party. Octopus Gourmet Restaurant - serves flavorful Caribbean cuisine. Ocean Grill - features a variety of fresh meats, fish and seafood on the grill. Sapore di Mare - offers delectable Italian cuisine. Guests should make reservations with guest services for the a la carte restaurants and the dress code is: casual-elegance (shorts and bathing suits are not permitted, shoes are required). Parents can truly unwind knowing their kids are having as much fun as they are at Gran Ventana's Kid's Club. This supervised recreational program features many activities for children between 4 to 12 years of age including: volleyball, aerobics, coloring, Spanish lesson, swimming contest, tennis lesson, drawing contest, club dance lesson, beach walk, sand castle contest, parties and countless crazy games that kids can't get enough of. Guests of any of our three hotels can enjoy great golf at the adjacent Playa Dorada golf course, designed by Robert Trent Jones Sr. in 1978. The signature course was created for all types of golfers, from beginner to professional, providing a challenging, yet fair environment for the ultimate golf enthusiast. Set throughout the Playa Dorada hotels and complex, the 18 hole, 6,730-yard, par-72 course features lush terrain, sloping hillsides, wide fairways and huge sand bunkers. In addition, signature hole 4 features lush greens bordering the land and sea, and hole 5 borders inland water. Gran Ventana Beach Resort Review location:Gran Ventana is situated directly on Playa Dorada beach in the heart of the tourist zone. Not too hot and not too cold, Puerto Plata has perfect weather. It has a tropical climate all year long with very few variations and only two seasons of the year, summer and winter with an average annual temperature of 77º F. The ocean breeze and tropical vegetation create a relaxing atmosphere. The International Airport of Puerta Plata “Gregorio Luperon” (POP) is only 11 miles (18 Km) from the city. Usually, you can find a taxi or catch a bus to the hotel for a reasonable price. Renting a car is another alternative. The majority of rent-a-car companies have an office at the airport. The official currency of the Dominican Republic is the Dominican Peso, which is divided into 100 cents. Although it is not official, the U.S. Dollar is widely accepted in all parts (and sometimes even preferred over the peso). It is legal to exchange money in commercial banks, exchange booths, and hotels. The exchange rate is determined by the Central Bank and is based on market conditions. Most banks are open Monday-Friday from 8:30am to 3:00pm. Major credit cards which are accepted include, Visa, Master Card, American Express, and Diners Club. ATMs are located at various points in the Dominican Republic. Puerto Plata, a city located on the northern coast, is known as “the girlfriend of the Atlantic,” and is characterized by its Victorian styles houses. Squished between the Atlantic Ocean to the north and the majestic mountain Isabel de Torres to the south, this city was originally a refuge from pirates and conquerors. It is the most important artisan center of the Dominican Republic with an abundance of hand made crafts. You will also find famous amber mines which is turned into beautiful jewellery with various colors and designs. 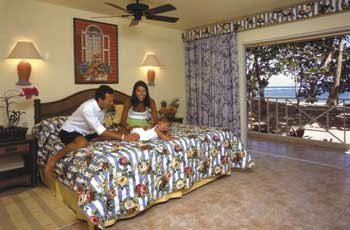 Anxious for your trip to Gran Ventana Beach? Hit any of the "Get Quote" buttons on the page and we'll send you a booking confirmation form or give us a call toll-free and we'll answer any questions you may have. Let's make that dream vacation a reality - join the Punta Cana Information Guide Family. Do your own Gran Ventana Beach Resort Review this season!